Standing with his left hand raised, the Buddha prevents the approach of a sandalwood image of himself. While the Buddha was in Tavatimsa heaven, King Udayana had a sandalwood replica of the Buddha made. When the Buddha returned from heaven, the image miraculously came to live and greeted him. 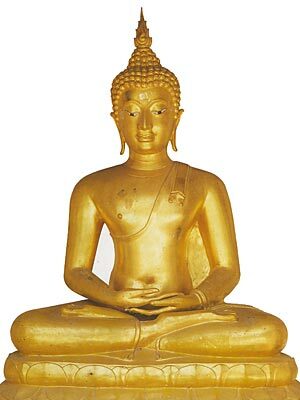 The Buddha made the statue stop and return to his seat, to be a model for further representations of the Buddha. Meditating in the diamond posture. Notice that both soles of the feet are visible. Standing Buddha image, both arms to the side of the body . The Buddha makes a footprint of his right foot. The footprint symbolizes the movement and travel and the spread of Dhamma to many places.